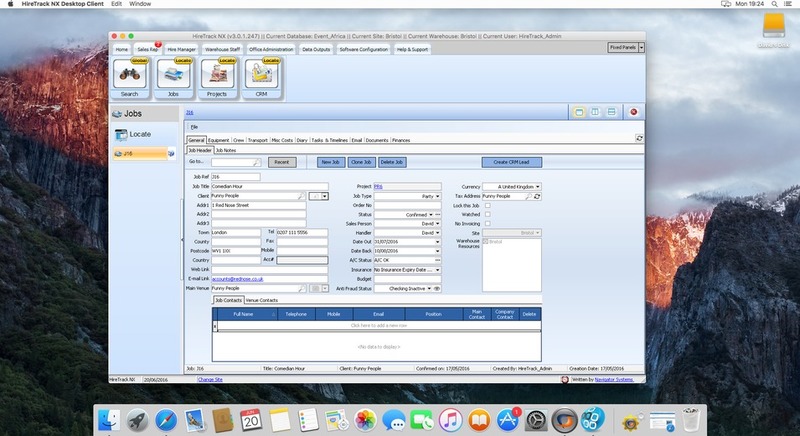 One of the most requested features for HireTrack NX has always been the ability to run our software on Apple Mac computers. Although lots operational departments in a rental business, such as repair & maintenance, testing and warehouse tend to operate on Windows PCs, management frequently favour Macs making it difficult for them to run management reports directly in the HireTrack NX Client. Prior to our latest version of HireTrack NX (3.1), released in mid November, the only way to run on a Mac was to either use a remote desktop connection to a Windows Terminal Server computer or to use a virtual PC piece of software, such as Parallels. Both of these solutions were expensive and required the purchase of a Microsoft Windows license. However part of the development of HireTrack NX 3.1 was to ensure our software can be run directly on a Mac. This is done through a Mac utility called Crossover, which cleverly allows certain Windows applications to run on an Apple Mac without any requirement for a Windows license whilst fully integrating HireTrack NX into the Apple environment, running as well as any software specifically designed for the Mac.